Lawrence 1993, p. 11, fig. 31; Chou Ju-hsi 1992, p. 347, n. 348, cites ‘a version of Hua Yan’s original treatment’, with a more descriptive title, in Christie’s, New York, 2 June 1988, lot 90; lot 91 is ‘a rendition of the same theme’ by Yangzhou native and resident Wang Su (1794–1877). Chou Ju-hsi 1992, p. 205. Both Ren Yi and Ni Tian announce in inscriptions on their paintings that they are following Hua Yan, although Ren Yi does a mirror image of the original, placing the horseman on the right and the footman on the left. Interestingly, Renyi states that the bird is a pheasant, and indeed it seems appropriately closer to the ground; in all other versions, our bottle included, the bird is flying much higher in the sky. Ni Tian's inscribed quatrain speaks of a wild goose fallen on the sand (though the bird in the painting has not yet been brought down); and Hua Yan's poem (in Lawrence's translation; the inscription is too small in the illustration to read directly) makes it a hawk shot from among the clouds. 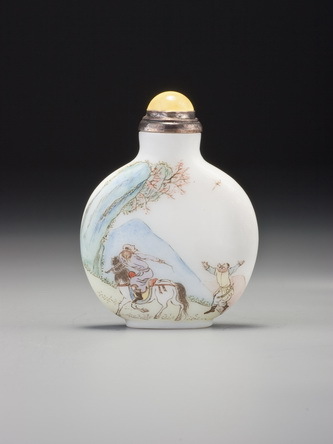 If one has a chance to inspect these paintings, it seems clear that the artist who decorated this bottle modelled it after the 1755 Hua Yan painting, his primary innovation being the addition of background mountains; where Hua Yan's vertical scroll format allowed him to suggest distance and height by leaving the middle of the composition blank, the snuff-bottle format forced the artist to use landscape elements to suggest the same spatial scale. Ni Tian was to do the same in his painting, which was an album leaf. Now, does any of this point to a Yangzhou origin for the bottle? No, but it does not disprove such an origin, either. Hua Yan’s painting didn’t have to stay in Hangzhou just because it was painted there; after all, it was surely not in Hangzhou that Ni Tian saw it 135 years later. It is harder to tell whether Ren Yi saw Hua’s painting or was guided by a description by someone who had; did he depart in so many ways from his model because he had not seen it personally, or was it because he was also working in a vertical scroll format and to follow Hua Yan closely would be simple copying, artistically uninteresting? But it is important to remember that communication between Yangzhou and these other cities was relatively easy and constant. 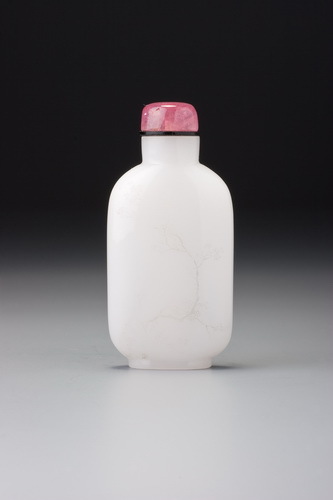 For a painting by Hua Yan to go back a friend or client in Yangzhou, where he had lived for two decades, would seem perfectly reasonable, and it could have happened immediately or sometime in the date range we feel is reasonable for this bottle. Just as reasonably, its owner at the time of the Taiping troubles would have looked for a way to get it to the safety of Shanghai, after which time it either remained there or circulated in the vicinity (including Suzhou). For another painting on glass of similar quality, although of different subjects, see Sotheby’s, London, 21 June 1995, lot 21, where lots 22 and 23 are also from the same general tradition.